Western philosophy is a term that refers to philosophical thinking in the Western or Occidental world, as opposed to Eastern or Oriental philosophy and the varieties of indigenous philosophies. Historically, the term refers to the philosophical thinking of western civilization, beginning with Greek philosophy in ancient Greece. The word philosophy itself originated in Greece: philosophia (φιλοσοφια), literally, "the love of wisdom" (philein = "to love" + sophia = wisdom, in the sense of knowledge and the courage to act accordingly). 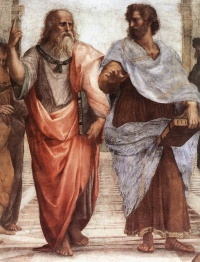 The ancient Greek word for wisdom was probably related to ideas about universal knowledge claims in mathematics, astronomy, natural philosophy, music, and many other subjects as indicated by Plato's and Aristotle's works, along with many other ancient and medieval philosophers. In contemporary terms, Western Philosophy refers to the two main traditions of contemporary philosophy: Analytic philosophy and Continental philosophy. Western philosophy has had a strong influence on, and has been greatly influenced by, Western religion, science, and politics. 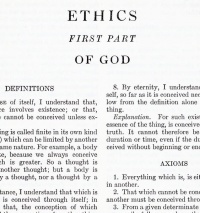 Indeed, the central concepts of these fields can be thought of as elements or branches of Western philosophy. To some of the ancient Greeks, these fields were often one and the same. Thus, philosophy is an expansive and ambiguous concept. Today, however, what generally distinguishes philosophy from other Western disciplines is the notion that philosophy is a more fundamental, classical, and universal form of thought than the other disciplines which sprouted from it. Unless indicated otherwise, the text in this article is either based on Wikipedia article "Western philosophy" or another language Wikipedia page thereof used under the terms of the GNU Free Documentation License; or on original research by Jahsonic and friends. See Art and Popular Culture's copyright notice. This page was last modified 12:30, 29 October 2014.